Introducing the Avenger mid back big and tall chair from OFM. The Avenger series was specifically designed to provide the big and tall user an unmatched level of comfort and support that lasts the entire workday. Features include a generous 23.5" wide seat and 500 lb. 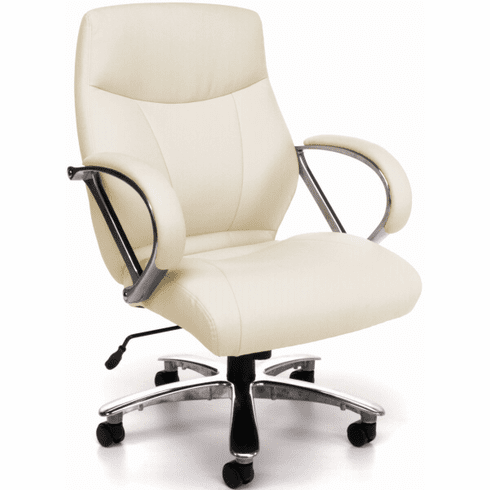 weight capacity, contoured, plush foam padded seat and backrest with built in lumbar support curve, waterfall seat edge for better circulation to the legs, soft yet durable synthetic leather upholstery, full length padded loop arms, pneumatic seat height adjustment, 360 degree swivel, tilt mechanism with tilt lock, tilt tension control, chrome finish arm frame accents and a heavy duty 28" chrome finish base with dual wheel carpet casters. Hard floor casters available for a minimal charge. This big and tall chair meets or exceeds ANSI/BIFMA standards. Dimensions: Seat Size: 23.50"W x 21.25"D. Back Size: 23.50"W x 25"H. Seat Height Adjustment: 17.5 - 21.75"H. Overall: 40.50" - 44.75"H x 28.5"W x 30.5"D. Weight: 64 lbs. Limited lifetime warranty from OFM. This chair normally ships within 2-3 business days. © Office Chairs Unlimited. All rights reserved.